Three-dimensional (3D) printer technology today is often used to make a variety of objects quickly and used goods. Later there that create firearms, aircraft parts, cars, and even food. And now 3D printers with machines that add layer after layer of quick-drying cement in a process called "contour crafting" are used to build houses. 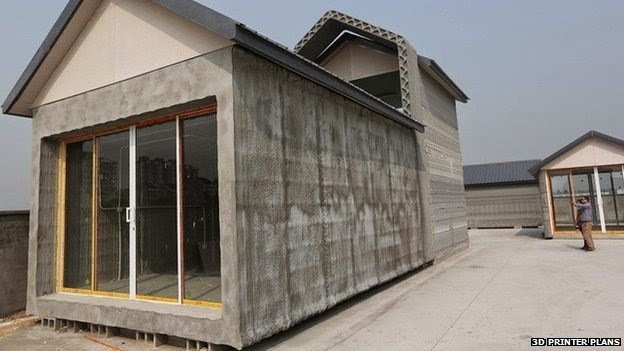 A private firm in China named Win Sun managed to build a house with just a giant 3D printer. The 3D printer has a length of 32 meters, 10 meters wide and 6.6 meters high. The company set up four pieces of this giant 3D printer to build a house. In one day, the Chinese company managed to build 10 small house using four giant 3D printer in the high-tech industry in Shanghai. As reported by the Daily Mail on Thursday, May 1, 2014, the cost to build a small house construction is very cheap, at only around U.S. $5,000 or aprrox Rp. 50 millions. The basic material used to build this house is able to cement that dries quickly. The cement material withheld by the company, but the cement material was derived from junk. The technique of making the home 3D printer is similar to the technique of making a wide variety of other objects with a 3D printer technology. Cement is formed according to the design and carried out gradually in a layer-by-layer. Until finally the top layer covered with a roof. "We can 'print' the building of digital design designed by our customers. Workmanship fast and cheap," said Win Sun senior officer, Yihe Ma.